A coastal rainforest surrounds Birds’ Hill Cottage in British Columbia. 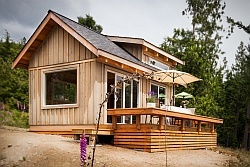 The vacation rental cottage is located on Salt Spring Island, a 90-minute ferry ride from Vancouver. With its board siding and peeled log porch posts, the exterior looks to my eye more like a classic cabin than a cottage. 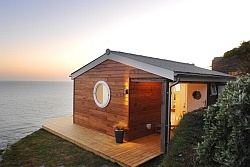 The inside, on the other hand, definitely says cottage with its white-painted board finishes accented by natural wood. This is a contemporary cottage, however, with an open-concept living area and soaring cathedral ceiling. Although the log post adds a rustic touch, it is countered by the modern flair of the concrete floors and counter tops. The cottage is roughly 800 ft2 (74 m2) with both a ground-floor bedroom and a large bedroom loft accessed by regular stairs. There is one full bathroom which features a large window in the bathtub/shower area, giving a bathing experience that one visitor described as like showering in the forest. If you look carefully, you’ll see that the bathroom has a partial vaulted ceiling to make room for the extra-tall window. That was made possible by keeping the loft above from extending all the way to the backside of the cottage. A small woodstove sits between the eat-in kitchen and the living area. With radiant heat embedded in the concrete floor, the stove is probably more for ambiance than heat, but would still be nice to cozy up to on chilly evenings. 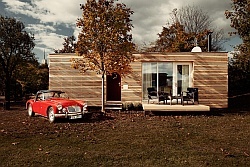 Porches on both front and back provide places to enjoy the forest air on hot summer days or rainy fall evenings. The back porch also offers the option of outdoor dining. The owners used welded wire panels to allow for a very transparent railing at much less cost than either tempered glass or commercially-available cable railing systems. Some building codes may not allow the wire mesh panels however, deeming them too easy for a child to climb. 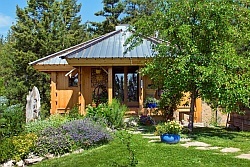 Birds’ Hill Cottage can be rented through VRBO. Enjoy the photos! Photographs courtesy of Birds’ Hill Cottage. Love the layout and all the large windows! I could easily make this our year-round home. I love everything about this house. 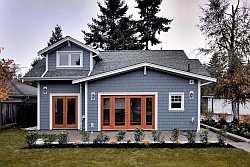 Can you buy plans/blue prints for this house? I’d be interested in purchasing plans if there’s one available. 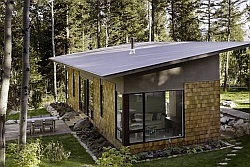 Great site for a fan of smart design and building. We downsized as well a couple years ago but once retirement is upon us we might do it again.